Virb, a social network that melds some of the customization options seen on MySpace with a mature and media-heavy atmosphere, has just launched a completely overhauled version of its service. The new site sports a very attractive new interface, reworked backend, and new social features that make it an impressive upgrade to the original, which launched in 2007. In conjunction with Virb’s reintroduction, hosting provider MediaTemple has annouced that it has set up a new venture platform called (mt) Ventures, which acquired Virb last summer and has also acquired and invested in several other projects. Virb originally launched its social network in 2007 as something of an experiment, and has since grown to a user base of around 250,000 users, including many musicians who use the site to share their music and find fans. But its developers say that they weren’t quite ready to keep up with the site’s growth, nor could they adapt quickly enough to encourage new waves of users. So rather than try to tweak the codebase they’d created, the Virb team decided to start anew, and have spent the last 18 months rebuilding their social network into something much more robust than its previous incarnation. Rather than try to replace the dominant players in the social network space, the Virb team acknowledges that most people have already established online presences at other social networks like MySpace and Facebook. They explain that Virb is meant to help fill the gap left by these other networks, and is meant as enhancement – not a replacement – to those networks users may already belong to. To reflect this, the site’s biggest addition is a social activity aggregator comparable to FriendFeed, but with a social network wrapped around it. Users can import photos from Flickr, stories from their RSS reader, and other content from the growing number of social sites on the web with an API. But many of these activities can also be accomplished using Virb itself – for example, it has a rich music player/sharing tool and photo galleries, putting a strong emphasis on media sharing. These features are meant to attract new Virb users who may not already have fulfilled these needs elsewhere, without alienating those who have. 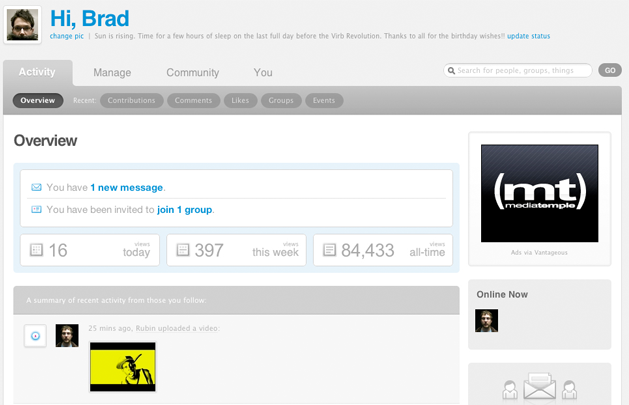 The site has also expanded on the ‘Friends List’ concept found on Facebook. Dubbed ‘Circles’, the site lets users separate their friends into groups. Users can then choose to selectively show items in their News Feed from a certain Circle of friends, allowing them to quickly weed through the updates they don’t care about. Eventually the site will also allow users to send a photo or event invitation to a certain Circle, without having to worry about any privacy settings they may have previously set for those friends. Another major improvement is the abilty for users to ‘skin’ their profiles. Previously the site has supported full HTML customization (and continues to) but many users don’t know how to use it. 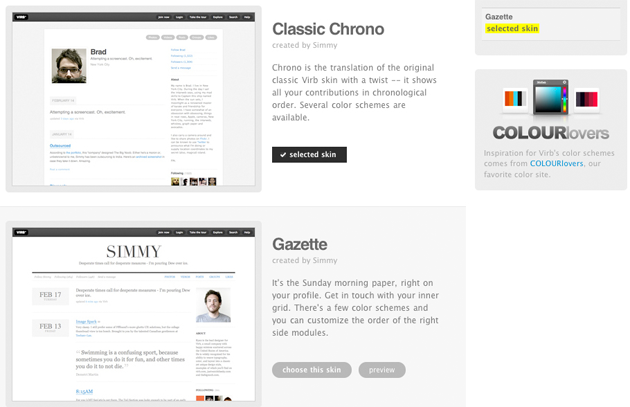 Skins are similar to WordPress themes, in that they can totally change the appearance of a profile – these aren’t just color palette swaps. The new skins allow users to differentiate themselves, and also allow users to drag-and-drop widgets in their profiles to rearrange their layouts. Such customization can come at a price, as evidenced by many annoyingly distracting and ugly profiles on MySpace. Virb used to get around this issue by offering a button at the top of every page that allowed users to turn the customization off for the profile they were viewing. But the company says that because its demographic tends to skew towards a more mature audience, few people ever used it it so they took it out (they promise to reintroduce it should the need arise). Virb’s biggest challenge will in the fact that it is yet another social network, swimming in a vast sea of competitors struggling to catch up to the likes of Bebo, MySpace, and Facebook. Granted, Virb has built up a userbase of over 250,000, including many musicians keen on sharing their music, but they’ve still got a long way to go. And while Virb’s emphasis on media may differentiate it in some ways from those major players, there are other sites like Multiply with a similar media bent. That said, the site looks really nice, so I wouldn’t count these guys out by any means. Disclosure: MediaTemple is TechCrunch’s hosting provider and is a TC sponsor.